Explore Atlanta's Krog Street Market, which is a mixed-use development in Atlanta's trendier locations. Krog Market resembles a west coast-style with multiple restaurants, and also includes up to 300 apartments. We will take your small group on pub crawl, designed for all the night crawlers of the city! Enjoy excellent food and drink on the East Side Trail of the Atlanta Beltline and leave the transportation to your driver. You'll find unique, specialty creations in the Krog Street Market. Formerly a warehouse district, it is now one of the new and trendy spots in Atlanta a variety of restaurants, bars, and a local butcher. The market includes stalls of seasonal fresh produce, prepared items and baked goods, as well as an open food court and specialty shops to keep you busy. 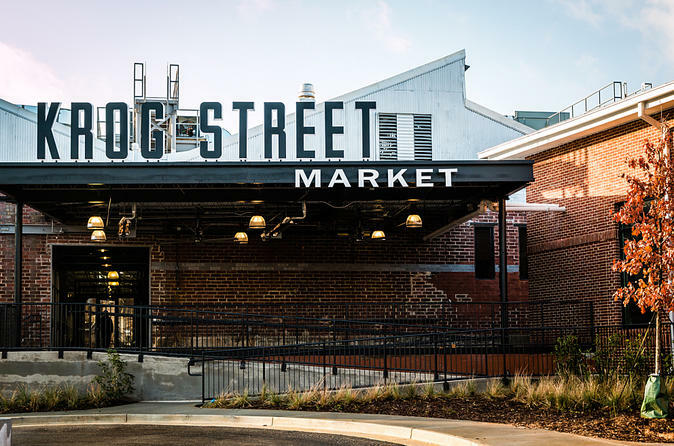 Located in the heart of Atlanta’s Iman Park (a wealthier area, evident by the massive stone houses and large green spaces), the Krog Street Market brings to life one of the city's most beloved neighborhoods. This small group tour picks up at select Atlanta hotels and includes roundtrip transportation.